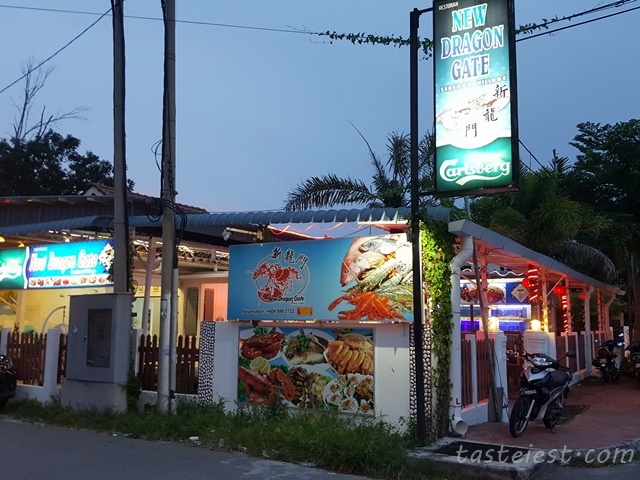 New Dragon Gate Seafood Village Restaurant located behind Viva Food Court (Small alley beside Chinese Swimming Club). As usual they always stock with fresh seafood such as lobster, crab, different kind of fishes and all other type of seafood as well. 金沙蒜焗生蠔 Garlic Butter Baked Oyster, honestly I am not a big fans of oyster as I can’t really find fresh oyster in local market but I am very impress with the way they cook it with garlic and butter that make it taste awesomely good. 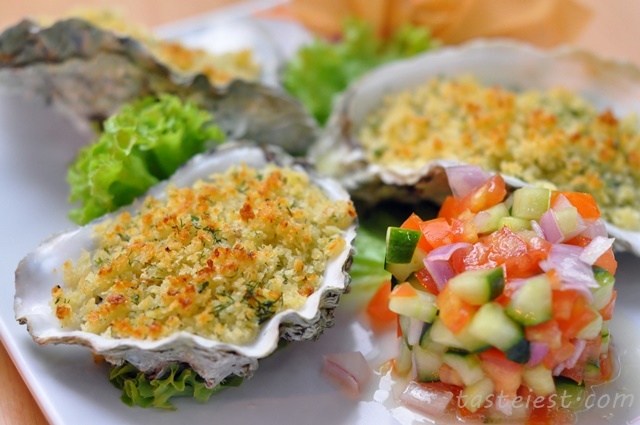 Oyster are extremely fresh and big in size, it has very smooth texture with milky taste. 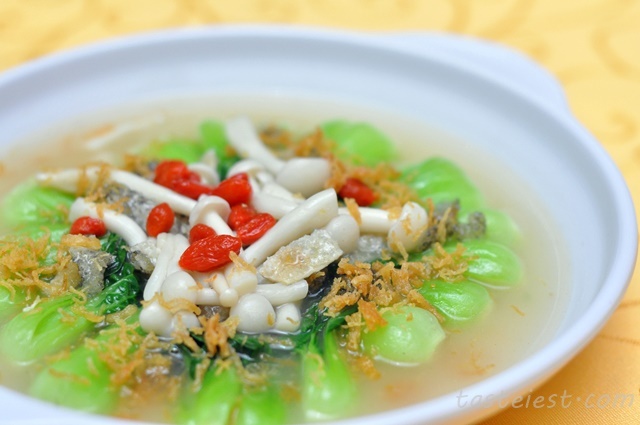 干贝鱼汤菌浸时蔬 Stir Fried Vegetable with Dried Scallop and Mushroom, the soup sweet taste extract from fish and dried scallop are very tasty. 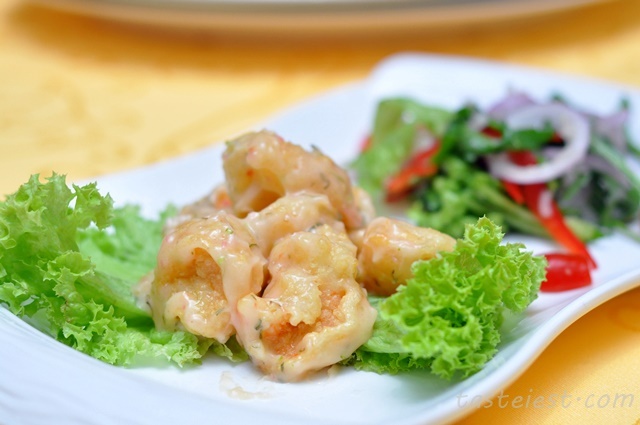 Topping with fish skin are special and taste good. 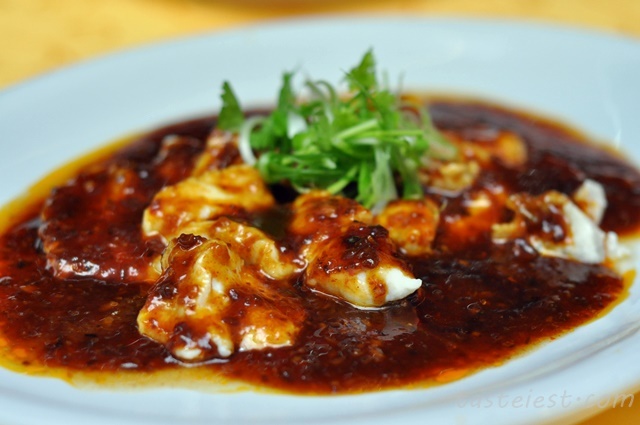 风味酱蒸石斑件 Steamed Grouper Fish with Special Sauce, the special sauce taste sweet with soy bean after taste. Slice fish meat is very fresh and sweet but we found the sauce taste a little bit too strong and overpower the fresh fish meat. 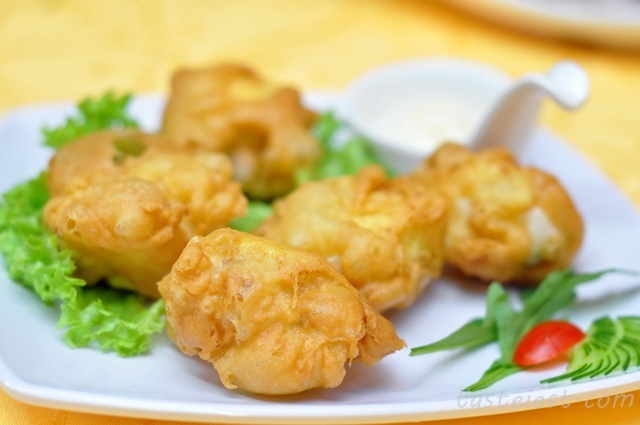 西叶酱虾球 Deep Fried Prawn with Special Sauce, big fresh prawn deep fried and coat with a layer of mayonnaise based sweet sauce. 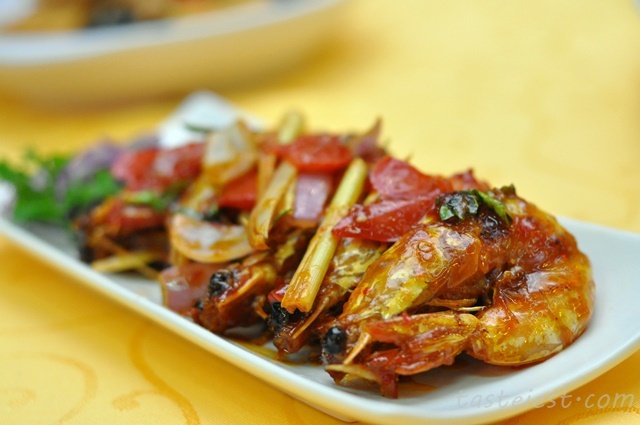 曼谷香辣炒明虾 Stir Fried Prawn with Bangkok Spicy Sauce, we love the spicy and sweet sauce coating on the deep fried prawn. 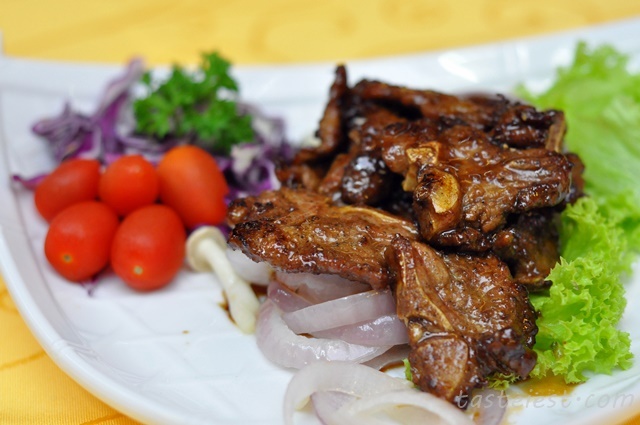 招牌香草羊仔骨 Signature Lamb, nicely marinated lamb grill to perfection, it has strong sweet taste and the most important is it doesn’t has any chewy texture at all. 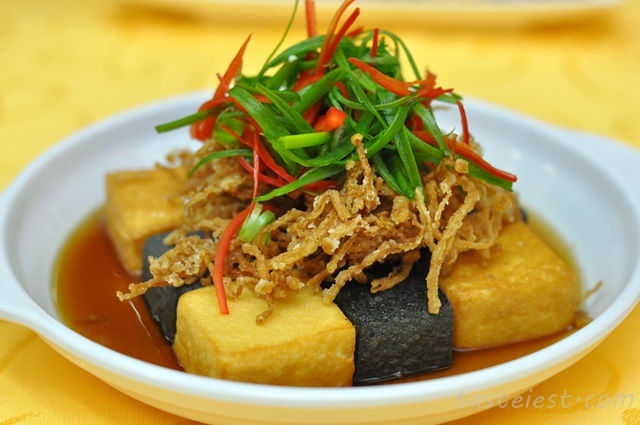 招牌鲍汁黑白豆腐 Braised Bean Curb with Abalone Sauce, charcoal made tofu that are extremely soft and smooth in texture, topping with abalone soup make it taste really good. 威化脆乳酪自制豆腐 Deep Fried Crunchy Homemade Bean Curb, it look like plain tofu but it full of surprise after on first bite, it has melting cheese in it which create a wonderful taste.